I reached my wit’s end last weekend. Our well pump was on the fritz, every DIY project that I had attempted all week was a failure and it was hot outside. The well being out was the worst. No well means no water. There’s just something about no water that makes your house feel broken. And really dirty. 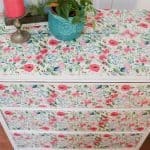 So I did what any sane person would do and started a new DIY project! 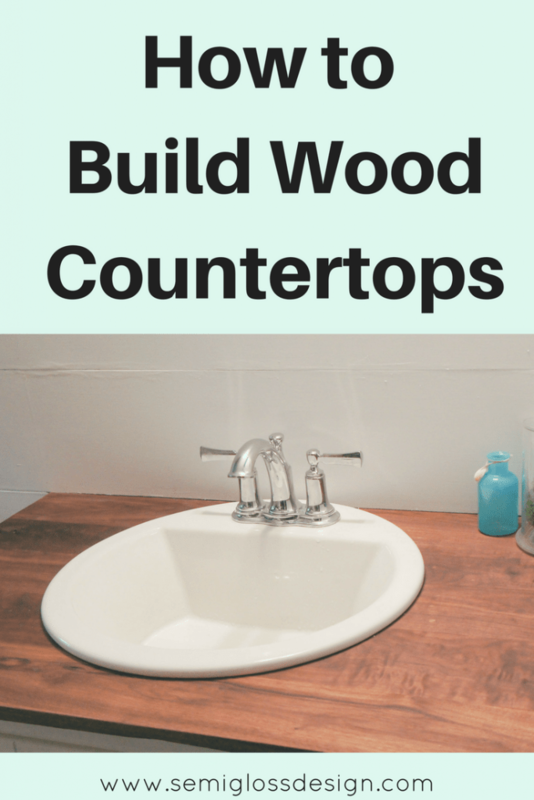 I couldn’t stand looking at our bathroom sink one more day, so we started working on DIY wood countertops for a mini bathroom makeover. 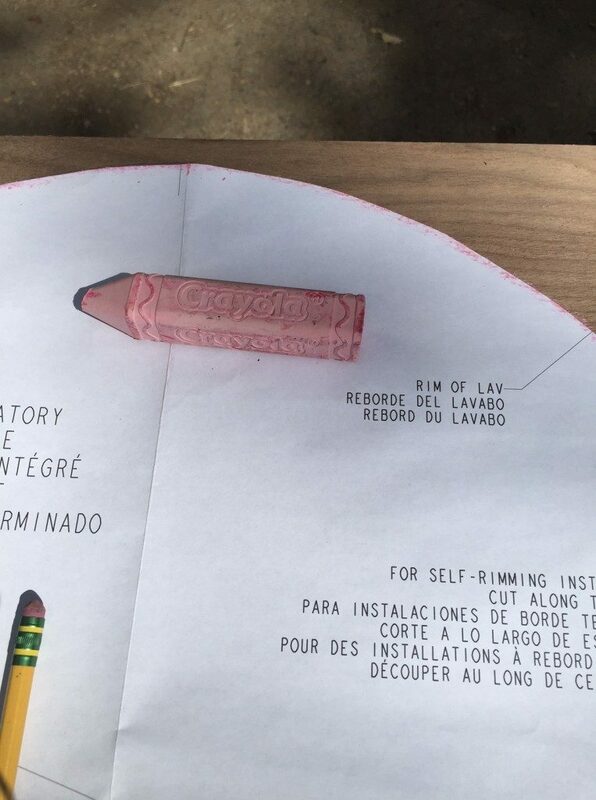 We had bought the supplies over a year ago, but we never got around to starting the project. There’s always something else that needs to be done more or sounds like more fun. When we bought the house, I gave each room a quick paint job after removing all of the wallpaper. 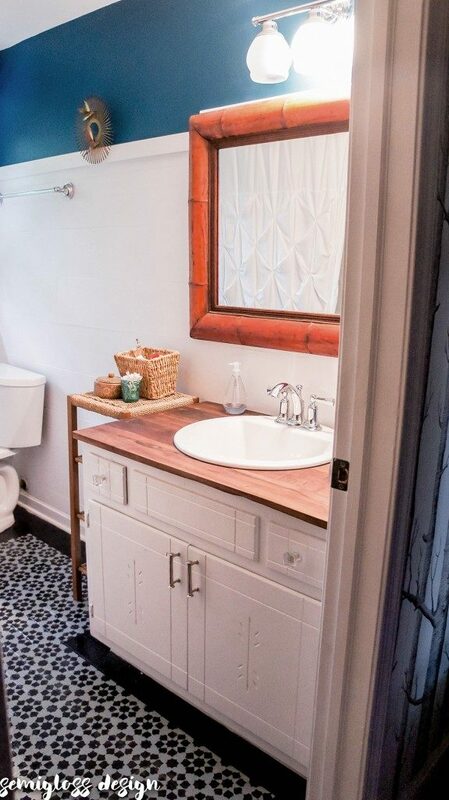 In this bathroom, I painted the dark wood vanity white and then the countertop stood out as being too yellow. So I primed it and painted it white. It has held up pretty nicely, but it wasn’t the problem. The sink was the problem. It’s one of those fiberglass sinks and time has not been kind to it. 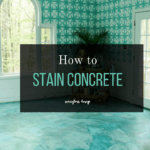 We have really hard water that has slowly eroded the finish on it, so there are nooks and crannies where mold starts growing and cannot be cleaned. It was too gross to take a picture of. You’re welcome. The sink had to go. 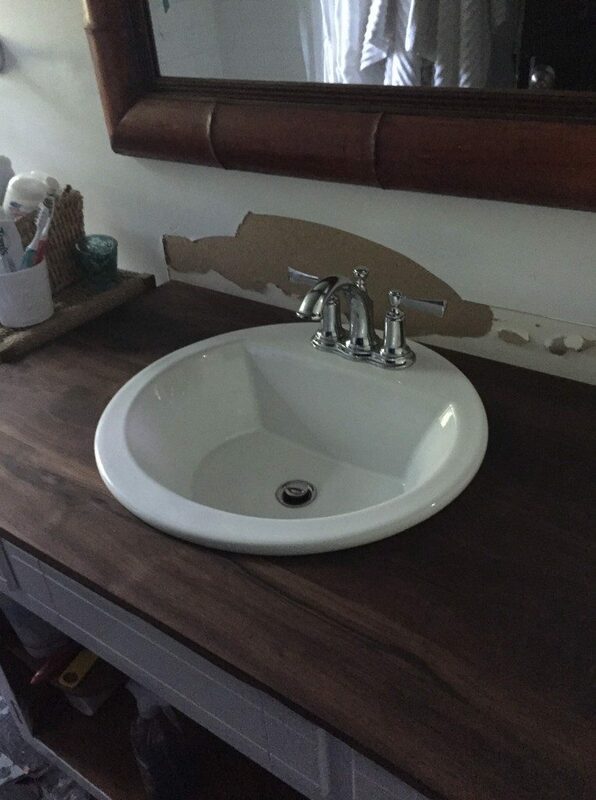 We had originally meant to just replace the sink, but I accidentally bought the wrong size. Instead of taking it back for the correct size (so heavy), we decided to make wood countertops to accommodate the larger sink. I had just planned on making them from 1×6 wood and staining them, but we had a ton of walnut planks left over from our farmhouse table. We used them instead. 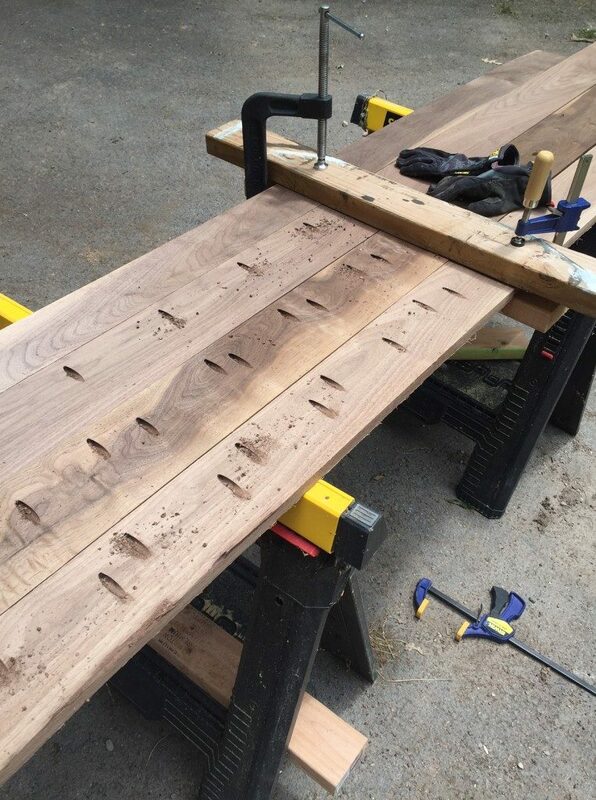 We bought our walnut from a local wood shop, Exotic Lumber, but some hardware stores sell wood other than the standard pine. Look in the larger stores. Walnut is so pretty and has such gorgeous graining. It is super easy to finish and take care of. Plus, it’s a hardwood, so it holds up better than pine. Our table has a few scratches, but they’re hard to notice. We leave cold drinks on it and wash it constantly and it’s still going strong. About every 6 months, we wax it. This takes about 15 minutes and makes the table look brand new. This is my long way of saying that I feel pretty confident that my bathroom gets less use and the wood will work out great in there. 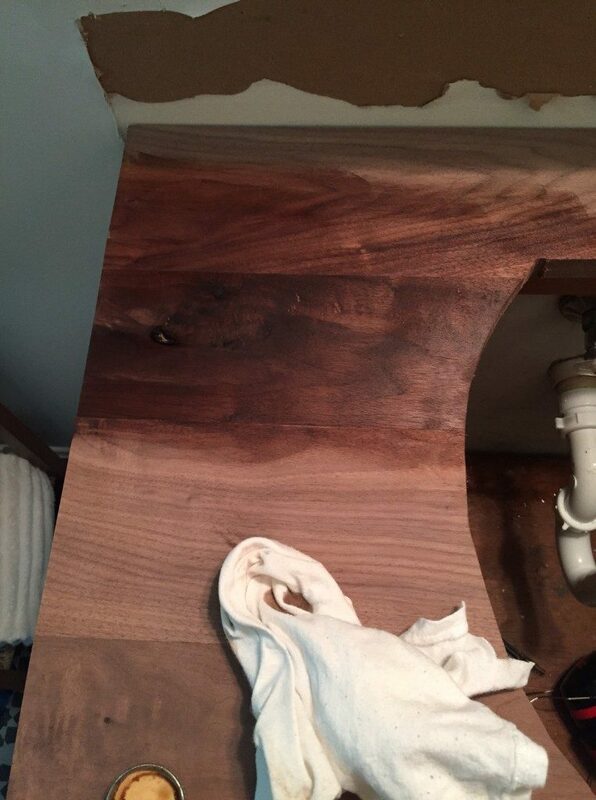 If it was a kid’s bathroom, I would probably seal it with a much stronger finish, such as waterlox. We used 2 different types of sanders to get the smoothest finish possible. It’s not necessary to have a belt sander, but your work will go much faster, even with changing the sandpaper 4 times. It’s worth it to make your wood as smooth as silk. 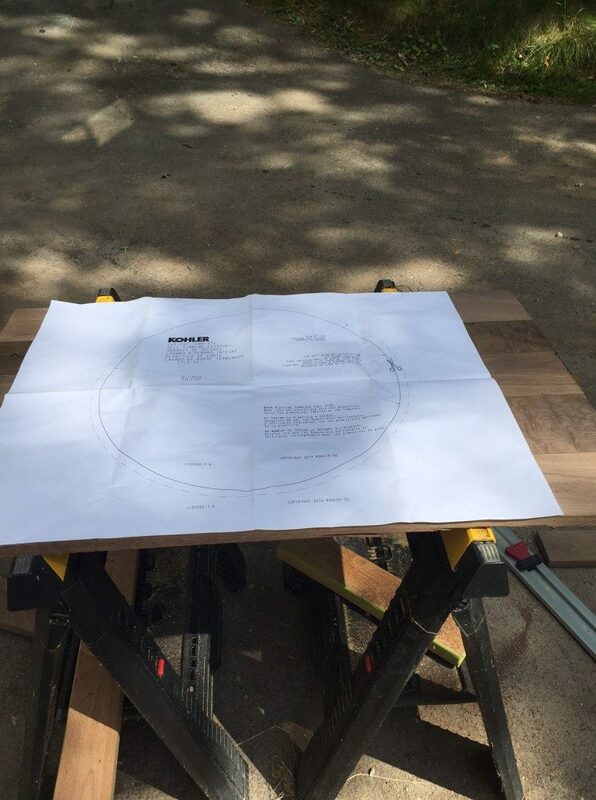 Lay your boards out and figure out your placement. Some of the boards had funky ends, so we moved the boards around until we found the prettiest parts. You also want to figure out which side is the pretty side. Flip the boards face down. We measured out a rough 36″ know which area we were working with. Mark out your kreg jig marks. We measured about 3″ from the end and then every 6″ after that. These will be our pocket hole locations. The last board needs no holes. 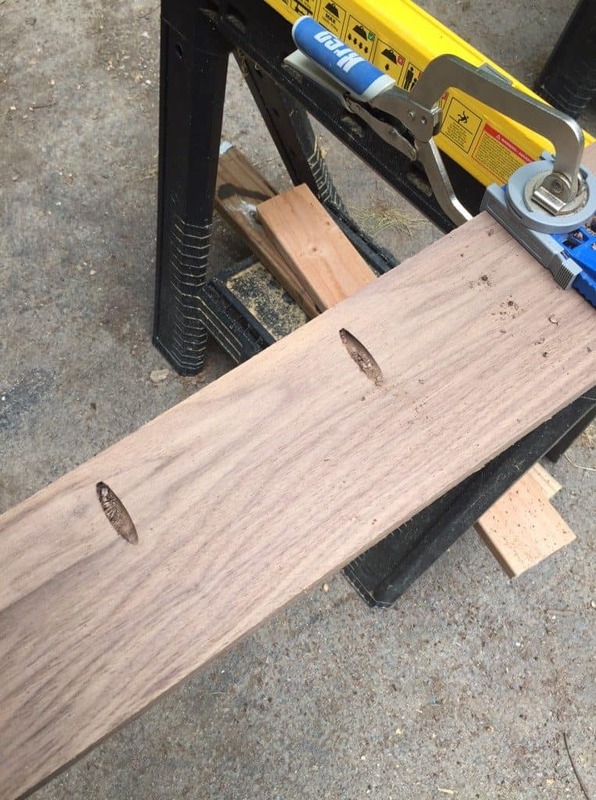 When all of the holes are drilled, reposition the boards to attach them together with the correct length of screws. We used scrap wood and clamps to hold the wood in place. Now the wood is one large slab. Measure out the length that you need and cut the wood now. We like to wait to cut the wood until it’s one piece because it results in a much straighter cut. Cut the sink hole out. We measured our old sink to get the proper space from the walls to line up correctly with the existing plumbing. Then we lined up the sink template on the wood. Cut the hole out. Drill a pilot hole big enough to stick a jigsaw blade into and cut around the circle. We left a little more of a lip than the template instructed because our new sink sits much closer to the wall than our old one and we wanted our countertop to be nice and strong. We made sure to leave enough space for the faucet plumbing to connect correctly. It’s not pretty, but it feels much more sturdy than the 3/4″ piece would have. Flip the wood over and begin the sanding process. It’s long but it’s worth it. We started out with 80 grit sand paper on a belt sander. 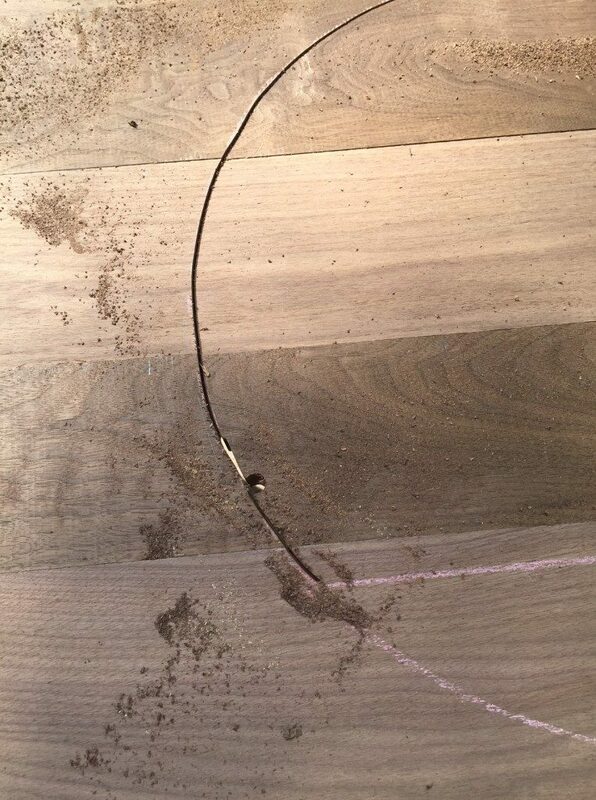 This smooths out any ridges between connecting boards. Then we moved to 120 grit on the belt sander. I then moved to my palm sander and used 120 grit, which is a lot more gentle than the belt sander despite the same sandpaper grit. Finally, I moved to 220 grit on the palm sander. 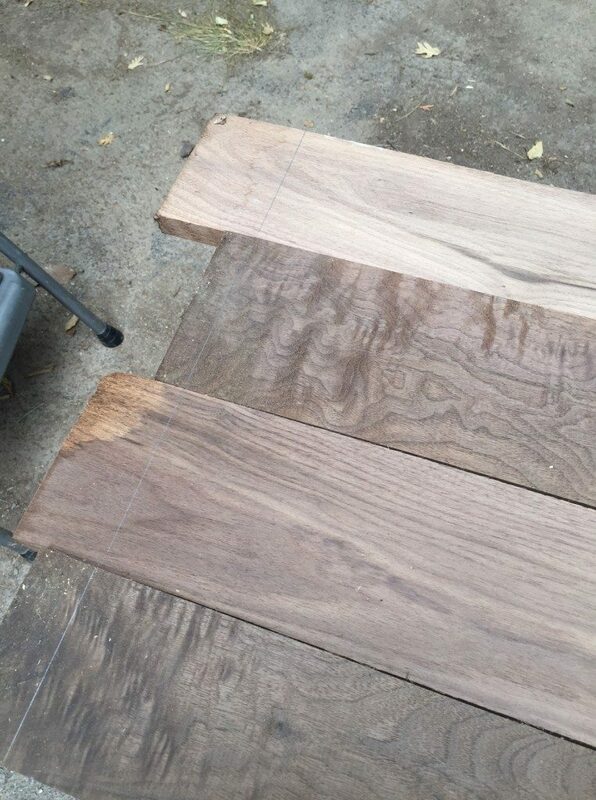 These steps may seem tedious, but in the end, your wood feels like silk. Now it’s time to make your wood beautiful. 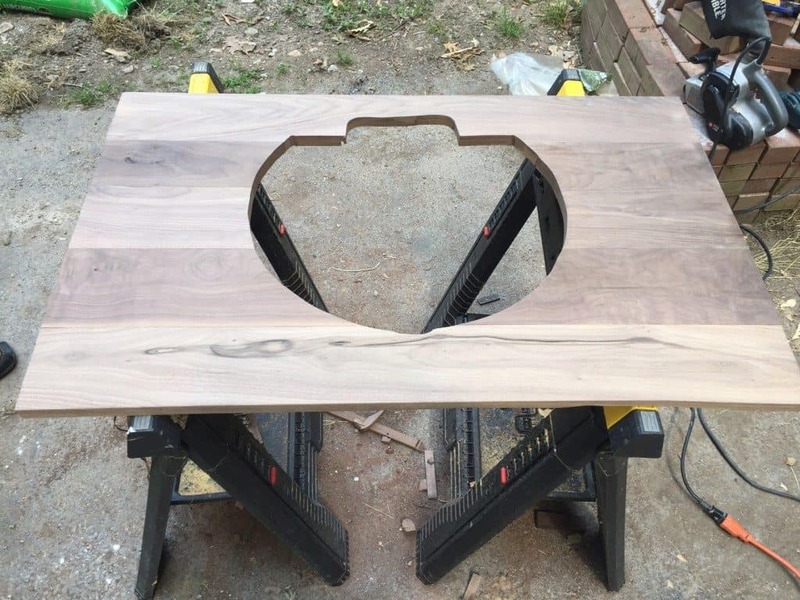 If you used walnut, like we did, it’s really easy to make it beautiful! 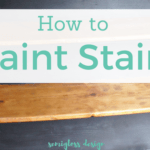 (If you used pine, now is the time to stain it.) Rub a thin layer of teak oil into the wood with a cotton rag. I let it sit for about 15 minutes before rubbing it again to take off the excess oil. You can do this step twice if your wood is really dry. The color of the walnut is already pretty! Now is the time to add the Howard Feed and Wax. Rub a generous coat onto the wood. Let it sit for about 15 minutes before buffing away the excess. 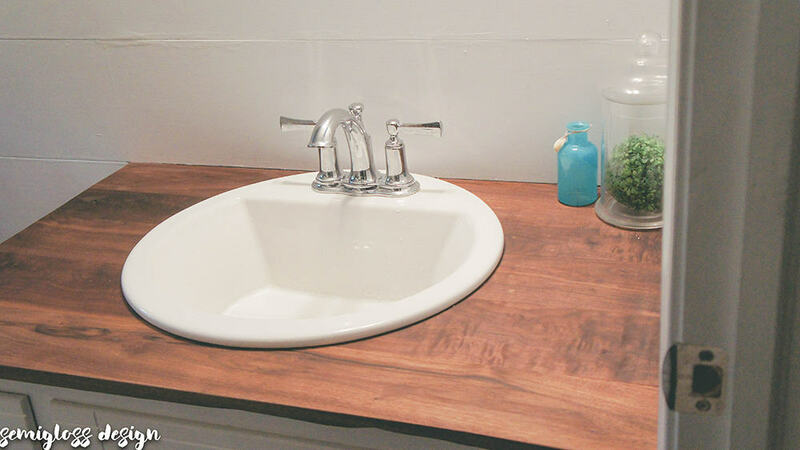 Attach the wood countertop to the cabinet with silicone and install your sink and faucet. 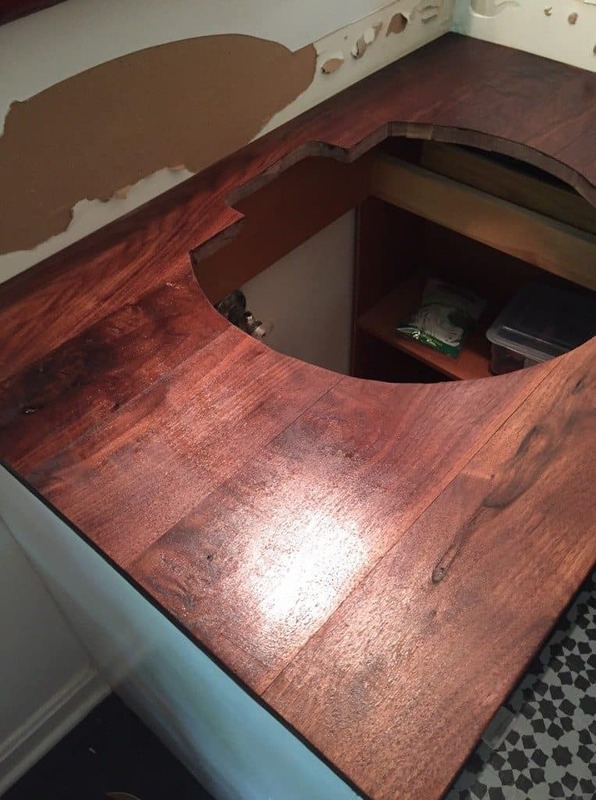 Complete all of the other work that this small upgrade required and you have a beautiful new DIY wood countertop! 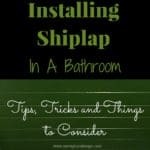 I’m finishing up the shiplap on the walls, but this bathroom already looks a million times better! If you like this post, you might also like these cut files for canister labels. 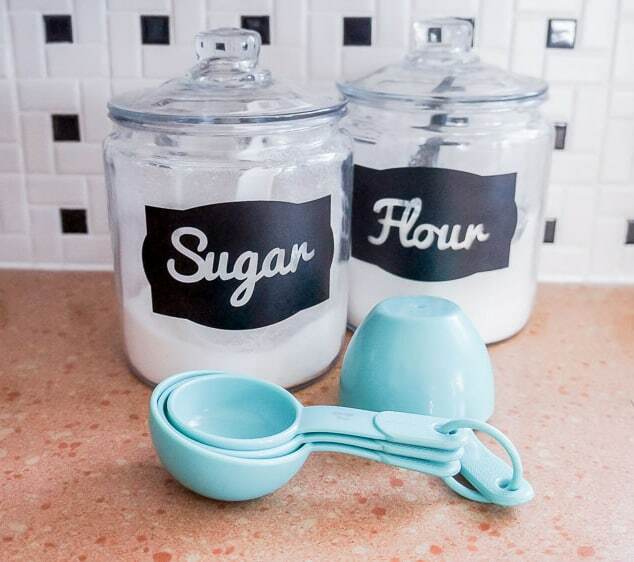 These make the perfect addition to your farmhouse style kitchen! 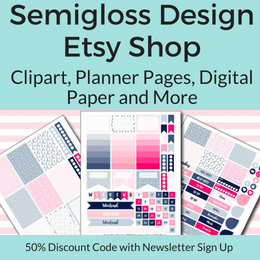 Get access to these cut files and so much more! An email will be sent to you with the link and the password. Walnut is so beautiful! Looks so wonderful and I bet it will hold up for a very long time! that turned out so beautifully! Walnut is my favorite! Looks amazing, and what a great way to use up some leftover lumber. Thanks Lidia! I love working with walnut. It’s so easy to make beautiful.